Cloud Computing Examples | How Cloud Computing works? Cloud computing may be a term unfamiliar to many people, but it is actually a computer service that most of use are using. The typical definition for cloud computing says that it is the use of a network that is comprised of remotely connected servers. This computer infrastructure, despite the various locations, can store, manage, and process data through the Internet. With all these definitions available in the Internet, we encounter discussions about cloud computing examples that are within the common consumer’s knowledge. Some of us don’t know but we are actually using cloud computing every day.Every time we access the Internet through our device for a particular data, regardless if that is work-related or for entertainment, there is a good chance that you are using cloud computing. Among cloud computing examples, Netflix takes advantage of the cloud computing feature of on-demand resources. Peak times of streaming face a large demand for server load. Using cloud computing services allowed expansion without the expenses in setup and maintenance of infrastructure that can cost too much compared to migrating from in-house data centers to cloud. Since Netflix gets daily increase or decrease of subscriptions, and the viewers that access their data are not consistent every day, this flexibility for data centers and server resources opened possibilities for the company to open for more subscriptions and pay for what they only consume. These cloud computing examples are intelligent bots brought by the capacity of cloud computing to provide a personalized customer experience that is context based and relevant. Using basic commands that are programmed to initiate computer response, these bots can provide calculated assistance thru Artificial Intelligence technology. Also, these natural-language chatbots continuously develop as an important Artificial Intelligence (AI) technology in cloud computing solutions. Personal data can also be stored remotely through the cloud. Emails, calendars, Skype and WhatsApp are cloud computing examples that we use every single day. They make use of the cloud feature of remote accessibility of data in order to keep our personal data in the cloud infrastructure, helping us access them thru the Internet anytime, anywhere. Network-based communication tools like messaging and calling apps satisfy our needs for personal connectivity. Office tasks can now be accessed online through cloud. The Microsoft Office 365 and Google Docs are the office tools under cloud computing examples. These allow us to use tools for work necessities through the internet. Documents, presentations, and spreadsheets are now accessible anytime, anywhere. Data loss is no longer a problem and data sharing is much more efficient. Aside from cutting the time needed for data transfer, collaborative work is possible when documents are accessible to multiple end users. The power of social media is undeniable, yet this is the most overlooked cloud computing example. Some of these platforms that keep communities connected are Facebook, LinkedIn, MySpace, Twitter, and others. These sites are designed to gather people together depending on their connection and their level of interaction. The process of building a network of communities, we also build network-based storage of our personal data, which is the cloud. Since the cloud can expand its resources based on the demands of the website, it can easily accommodate large data for storage and still be open for continuous growth of this collection of information. 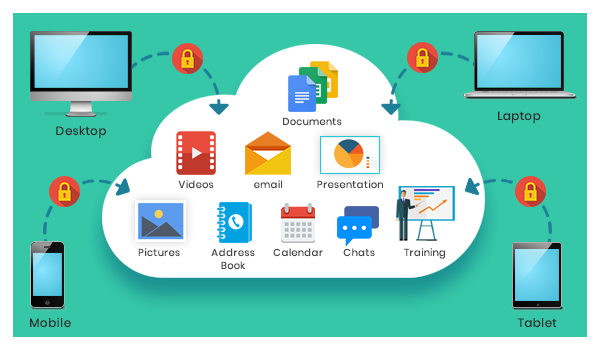 Dropbox, Google Drive, and Amazon S3 are the most popular online storage that can keep our files readily accessible anytime, anywhere. They are the cloud computing examples that us take our data with us as long as we have the Internet connection to access them. Whenever we save files into these applications, we are already saving our files into the service provider’s server. These applications serve as a backup of your files and provide a flexible storage size as demand arises. Also, recovery of data is easier in the cloud, while it keeps your data secure. our constant use of the cloud and the cloud computing examples that play important roles in our daily activities helps us understand the technical jargon and how it can open more opportunities for further development of our means of communication, entertainment, data filing, socialization, artificial intelligence and file handling in the near future.